Called the German Valentino, designer Guido Maris Kretchmer’s fall-winter designs showed his passion for design and fabric. From an early age, his fashion career blossomed when he received his first sewing machine. Within a short amount of time, Kretschner became one of the most successful designers in Germany. His looks are unique, exciting and stylish. His versatility is reflected in both of his collections. For his premium line, he designs high-quality cocktail dresses and glamorous evening gowns. The Guido Maria Kretshmer collection focuses mainly on ready-to-wear looks and business looks. His clothes are worn by such stars as Charlize Theron, Christine Neubauer and Alexandra Maria Lara. Several models trust his fashion expertise, and they love to wear his clothes on the red carpet. The designer has also published two bestselling books, and his designs were spotlighted in a documentary that aired on the German TV channel VOX. Another designer to watch, Hernan Lander showed a great fashion collection at the European shows. With an innate desire to push boundaries, Lander employs visions of modern art and innovative forms of architecture in his collection. His journey began in the Dominican Republic at Altos de Chavon. His contemporary designs were extremely elegant. Paul Nathapol’s collection was inspired by the 1950s philosophy movement and existentialism, where one’s freedom to express the individual experience is explored. His designs emphasized the uniqueness and isolation of these experiences and how they play such an important role in one’s existence. As one of the country’s most talked about celebrities, Nur Fazura Sharifuddin is no stranger to life in the limelight. Two Fridays ago, the actress, singer, producer and reality television star made her Kuala Lumpur Fashion Week debut as a fashion designer. Her fashion label, House of Doll, started three years ago and it was all things glitzy, replete with sparkles. At the last show of the day, the crowd waited in anticipation and after a daring screening of a video montage, screams and cheers were heard. Fazura’s collection — filled with flattering cuts and tasteful amounts of embellishment — was a nod to female empowerment. “I always like to celebrate women. You can see in the montage, a lot of women who since school, get bullied and housewives get hit and bullied too,” said Fazura during a quick chit-chat after her runway show. Flanked by her entourage and a group of journalists, she added that the collection was about transgender people as well. “I don’t like how women get discriminated and how transgender [people] want to be themselves but can’t,” said Fazura, who shared that she has many transgender friends. The multitalented designer’s collection was nothing short of shiny and bright. “All the colours, sequins and sparkles — those are the things I like and I think women should be out there to dominate the world,” quipped the pint-sized actress, who shed tears of joy after showing her collection. But more than all that glitter, things have come full circle for the 31-year-old stunner, having studied fashion design prior to her big break in the entertainment industry. For Fazura, it has always been a learning curve. “I’m still learning. I have a lot to learn but I’m going to give myself a little bit of credit because I thought the collection was quite nice,” she said, smiling. The celebrity designer worked with her team to make the collection a success and even selected the fabrics on her own. To say the least, it was a fulfilling experience for Fazura who acknowledged her team’s hard work and efforts. As a result, not only was a beautiful collection produced, Fazura excitedly shared that she had injected her personal style into each and every piece in the collection. “I just wish I could wear some of the styles such as the cropped top,” she said.Those who are acquainted with Fazura’s personal life would know that being under the constant glare of the media is not exactly a walk in the park. For example, the term ‘controversial’ had been applied to personalities like her. But what does it actually mean? “But now, celebrities have Instagram, okay!” she said with a laugh, adding that social media allows public figures like her to write their own narratives and defend their opinions. With so many feathers in her cap and a growing list of duties, Fazura joked about “going to outer space” next. On a more serious note, the stylish designer shows no signs of stopping and already has her next game plan sorted out. “I want to travel and backpack around the world and I want to help the Syrian refugees,” shared Fazura, who was decked out in a satin cream suit paired with Sophia Webster’s coveted butterfly sandals. But for now, as the excitement of fashion week slowly comes to a halt, Fazura can finally put her feet up from all the hectic multitasking. GREEN TEA -Green tea leaves aren't fermented and hence, don't go through the oxidation process that black tea undergoes, making it extremely rich in the EGCG (epigallactocatechin gallate), a popular antioxidant known for fighting cancer, cardiovascular conditions and more. -Green tea contains 1/4th of the caffeine that coffee has, making it healthier. -Since oxidation is arrested, it is believed that more polyphenols are preserved. -It supports weight loss programmes that include diet and exercise. -Green tea leaves is good for afternoon breaks and meditation in the evening. -It is less acidic and so, washes off acidic waste. -Pure organic green tea creates a detoxifying effect, giving you glowing skin, boosted metabolism and stronger immunity. Make the perfect green tea Bring 220ml water to 80°C. Add two grams of green tea leaves. Let it sit for three minutes. Strain and serve. Do not add anything. BLACK TEA -The EGCG in black tea is destroyed during the fermentation process. 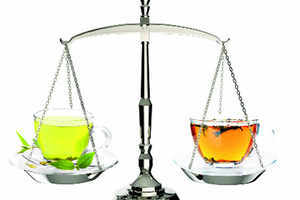 Hence, green tea is ahead of black tea in its antioxidant quality and quantity. -Black tea contains 1/3rd the amount of caffeine your coffee contains. -It hydrates the body and strengthens the immune system with bacteria-fighting antioxidants and promotes blood flow to the brain. -It improves focus and concentration. -It's a morning 'eye-opener'. -Black tea and coffee are more acidic. Mild black tea needs lemon to kill acidity.